For the average person, the idea of calligraphy is that of a dead craft; a long lost skill for recording historic accounts in the past. Not so. Though an old method of writing, calligraphy is still going strong today as one of the most beautiful forms of art for anything from wedding invitations to webpage titles. Possibly deriving from the Greek words “beauty” (kallos) and “to write” (graphein), western calligraphy has had a colourful history. 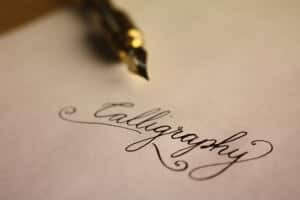 Beginning around 600 BC alongside the origins of Latin, the art of pen and ink began humbly enough with reed pens and papyrus before moving up to quills and vellum. From its Latin roots, the Romans adopted the practise of calligraphy for their wall art, not to mention also implementing it for their everyday use. It was from the second and third centuries that some of the most common font styles we still use today evolved (ever wondered where “Times New Roman” came from? Now you know). Though this means of writing grew to be widespread – reaching as far as Great Britain – calligraphy was almost lost after the Roman Empire fell. Throughout the Dark Ages of the fourth and fifth centuries, it was kept alive by the efforts of monks, who used calligraphy to make copies of the Bible in their monasteries. It is most likely due to their skills of preserving the art that we still have calligraphy today. 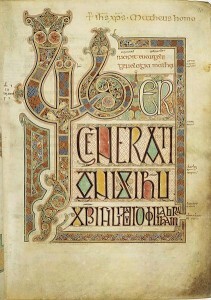 During the 7th century, calligraphy was strictly confined to the aforementioned churches and monasteries. However thanks to Charlemagne’s passion for scholarship improvement, he saw to the recruitment of a crowd of scribes to the Carolingian court for the purpose of furthering learning and education in literature, art and architecture. One of these scribes being a man named Alcuin, who developed the style Caroline, or Carolingian miniscule – a predecessor of Gothic script. 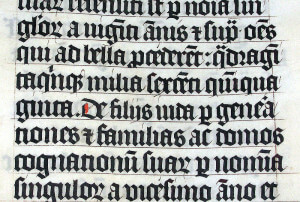 By the 11th century, Gothic script became more compact and was the form of calligraphic style that Johannes Gutenberg printed the Bible; the first major book to be printed by a mass-producing printing press. In the 1600’s, a variety of calligraphy styles had exploded over Europe. Italy developed the humanist miniscule font, whilst France created the Batarde style. Because so many different types of writing were prevalent during this time, French officials restricted legal documents to only three hands, one of which – Round Hand – is still a prominent variation used on prestigious invitations even now. After the invention of the printing press and its subsequent use, by the 15th century, illuminated manuscripts began to phase out. Calligraphy may have again threatened to extinction if not for a man named Edward Johnston, who is regarded as the father of modern calligraphy. 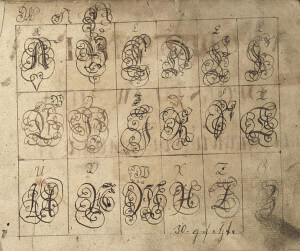 Through his study of manuscripts at the British Museum, Johnston’s interest in calligraphy was sparked, and he began teaching it at a school in London. An interesting tidbit: Johnston is responsible for the typeface still used at present by the London Underground, with minor alterations. Calligraphy today can be seen everywhere, even in the digital realms. You’ll see calligraphy starring in logos, letterheads, maps, menus, greeting cards, diplomas, inscribed in stone, videography, paintings and more. Often coupled with image editing software such as Adobe Photoshop or InDesign, the digital world has also embraced calligraphy by means of graphics tablets with their ability to enter old style lettering as pixels, rather than physical ink. Hand-lettering transcends so many areas of art, from wall posters to handwritten party invitations; wedding vows to murals. New pens such as Tombows and Copics are a huge market in the modern calligraphy scene, not to mention old favourites such as quill pens with ink and metal nibs. With now over hundreds of styles to its name, the art of calligraphy is still very much an active part of today’s culture, and continues to add to its incredible history. So why not try your hand at calligraphy? Drop down to your local art store next time you’re downtown and see what kind of style and type you’d care to explore. Who knows? Maybe you’ll become part of calligraphy’s next page of history!